The story of William Morrison has not been heard often enough. Born August 2, 1960, this native New Yorker found intrigue with chess and soon gained a reputation as a fierce blitz player who would take on all comers in the famous Washington Square Park. A naturally gifted player, William become known as "The Exterminator" for his tactical wizardry, a style which left a brutal trail of mutilated positions behind. This 1995 Maryland State Champ, has served as an instructor at University of Maryland-Baltimore (UMBC) and, as a student, has played on four Pan-Am Collegiate championship teams! A confident, but approachable young man, William is a student of history, but is also making a bit of it himself. 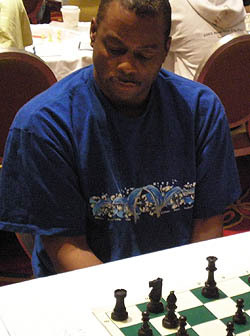 Having reached a peak USCF Rating of 2535 (March 1995), earned his second IM norm at the 2001 St. John's International. William needs to earn a 3rd and final norm, and in doing so, he will be the second Black player in the U.S. to earn the coveted title. One interesting note of William's career is the fact that he has played a World Champion. In 1997, Garry Kasparov paid a visit to UMBC and took on eight top players in the area in a simultaneous exhibition. The encounter lived up to its billing as "The Exterminator" came close to adding Kasparov's head to his impressive collection of scalps. The game was exciting, but the World Champion prevailed in a tactical ending. God willing, William will soon receive his International Master's title, and hopefully he will continue to serve as a pillar in the Black community with his continued service. See FM Morrison takes on World Champion; Morrison-Kasparov . See FM Morrison's triumph while earning his first IM norm; Morrison-Ady. See FM Morrison's triumph while earning his second IM norm; Morrison-Bonin.